61% of U.S. consumers say they have made a purchase based on a blog post. Not blogging on behalf of your business is costing you money. 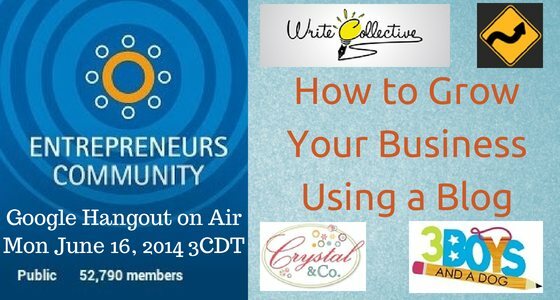 Join us tomorrow, Monday, January 16, 2014 on the Google HOA (hangout-on-air) series specifically for the Entrepreneurs’ Community, entitled “Pooling Our Knowledge” as we discuss How to Grow Your Small Business with a Blog. Live on Google Plus. You can click “yes” where it says “Are you going to watch” now. Ask questions live during the event or in the comments here or on Google Plus. Here is the video of the live event for replaying. Nice information about Growing your small business using Blog .thanks for sharing this post its realy helpful to all . Thanks Gail Gardner . great info! i agree with itbtw great share again! Did you see the video? I added a more extensive listing of the video highlights in my post on Social Media Today How to Grow Your Small Business Using a Blog [VIDEO]. No worries. All Google Hangout-on-air events are recorded and hosted on YouTube. I added the video to this post. Fantastic information! i started my business and will create a blog in the near future after reading your article.thank you for sharing! Sir i never seen this before that we can use hangout for this also you are great. I just went through the hangout video and I found it really helpful . I will be using these points in my small business , still feeling that i should have come through this post earlier , Thanks again Gary! Blog really play a very important role in any small business and its great way to interact with readers. If you have any questions, just ask. I’m happy to help. Great hangout! Will definitely share with peeps. Just bookmarked the post to check the hangout later. I guess it would be really great loaded with great information. I have followed you on Twitter. I have a lot of content here and elsewhere that is useful to bloggers. You may want to visit other posts. Also see and the posts on the portfolio tab. Richly informed article. This would surely helpful for small medium enterprise business. I wish I had all this knowledge when I started my business 🙂 I had to learn doing blog-business on my own mistakes. Good job! Michael would love you to read ..The easiest way to create a blog? Website builder! We are all always still learning. I drag bloggers into a mastermind group to get them to share what they know instead of each one trying to figure it all out one at a time. Information in the post I’ve put in CommentLuv. Hi Gail Garner I like to watch this video and if you have shared it at you tube that will very much helpful for the people. Please let me about any video link to YouTube. I would like to recommend that this is really helpful side. I added the video to this post. Great stuff. Yeah i really agree with it. Thanks Gail. You may also be interested in the summary of the Twitter chat on #AtomicChat the other day. They produced a Slideshare I embedded in the post in this response. Hey Gail GardnerThis is my bad luck I missed this great opportunity to get value from this event. I would love to watch its video if you have shared it at YouTube. Please do let me know if you are writing a post about it. Mi Muba would love you to read ..How to create money making infographics? I added the video to the bottom of the post.